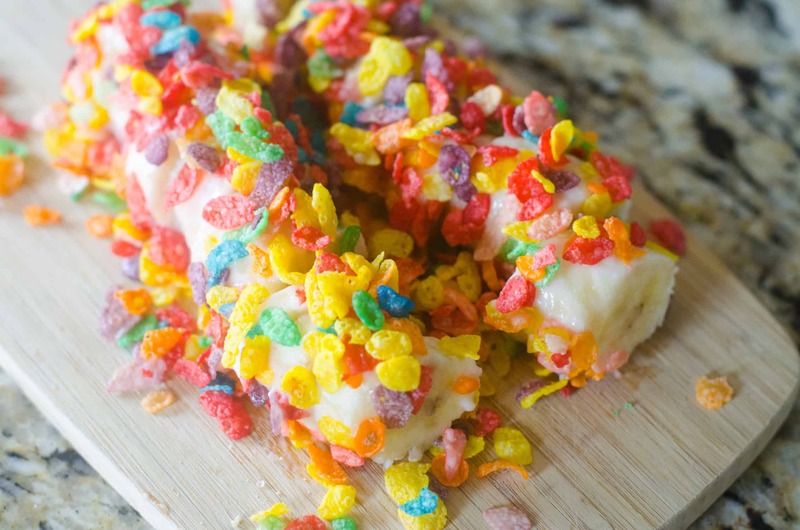 This Fruity Pebbles Banana Sushi is so fun for an afternoon snack. Pretty easy to put together either on the spot or even a day before. I like to do them in the moment because I like the crunch of the fruity pebbles. Plus who can resist eating a handful of the pebbles as you go. You know you can’t resist don’t even lie. This is pretty inexpensive snack too! It goes a long way and if you forget about bananas like I do you can always bake the dark colored ones into bread you know. I use the yogurt to let the fruity pebbles stick to the bananas. You can always do the yogurt and freeze for a few minutes to get them to really stick well. It’s more about the fun part of this recipe. 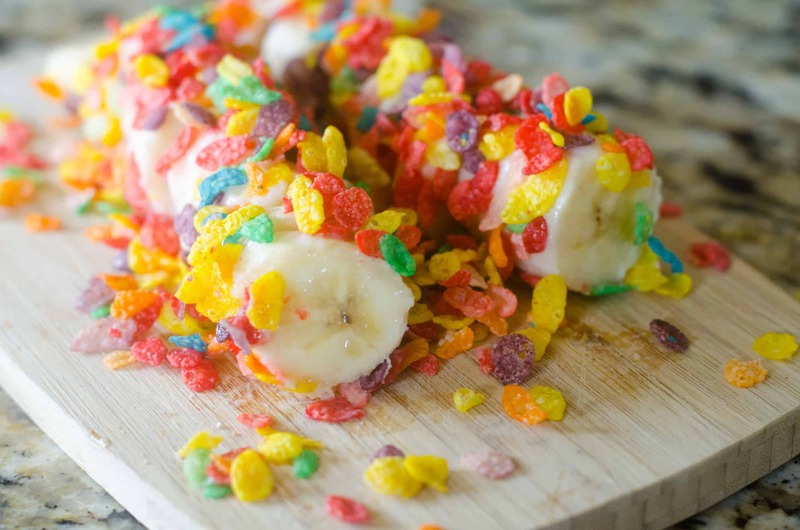 The colors of the fruity pebbles banana sushi will make it just that much more of a fun treat. Better yet it’s on the healthy side. The kids get the fun cereal they like but you get some fruit and yogurt into them and they will never notice! 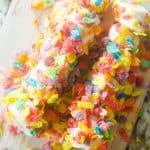 Additionally, these fruity pebbles banana sushi are plenty of fun to make with the kids. It doesn’t really require any utensils until the end which mom can cut with a butter knife. The kids can roll the bananas and have fun making food. What kind of cereal would you roll yours in? Place yogurt into one bowl and fruity pebbles into another bowl. 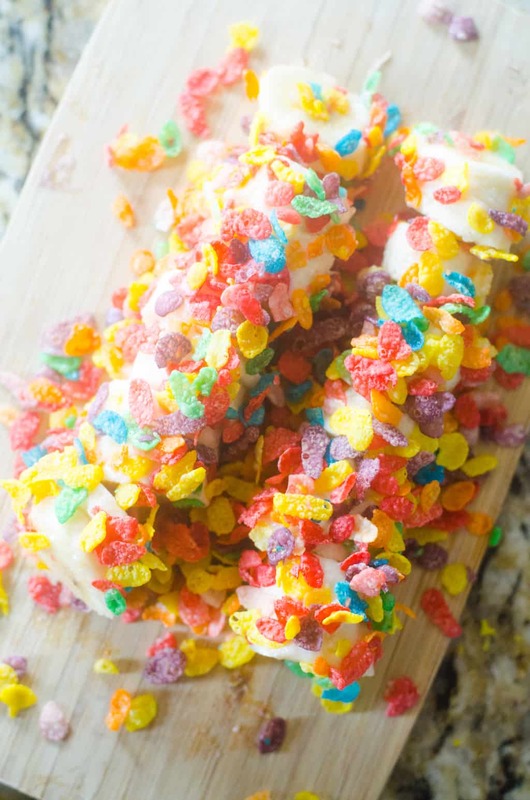 Peel banana and roll it in the yogurt and then roll into the fruity pebbles. Cut into sushi like slices and serve!